Did the Evergreen State and Hiyu not sit in with an Issaquah-130 a few years ago? Close. Sometime in the late 1990s, the Kttitas was out of service (for whatever reason) and was replaced by a steel-electric and the Hiyu. There is at least one other more recent than '81 time for three boats besides the mid 90's. I have pretty solid memories of 3 boats on the run as a small child. Given that I was born in '78 that would likely mean mid-80s. Could have been one of the last times Cathlamet expressed it's dislike for docks or during a reroute to Edmonds. I remember a lot of "waiting" off shore for whatever boat was there to leave the slip. I remember it as a single slip would could have been Edmonds or Mukilteo. I think what Barnacle is recalling is when Kitttas had some nasty propulsion problems, that was probably '10 or '11. Hiyu was around for a few days but then Evergreen State became available and replaced her after that. Hiyu couldn't really hold the schedule at 10/11 knots, Evergreen could but couldn't handle the traffic. Didn't know the HIYU was added then during that brief assignment. I do remember a "steel cabin-ed" SE ferry made a couple or so appearances there during their later years (after 1982) and I took a ride aboard one of them on a night run from CLI to MUK. For "SolDuc", the lady in the outbound wheelhouse said to me to just do a short blast. We did the same aboard the RHODODENDRON on her final Open Ship before she went to British Columbia. By order by the officer in the RHODY's wheelhouse, only short blasts were allowed as she did her final fanfare approach signal when she made her retirement landing at the EH VMC after being replaced by the CHETZY shortly before the Open Ship. On the other hand, we were instructed to sound the fanfare approach signal aboard the SALISH on her Open Ship day in Port Townsend the day before she began service to Keystone. Oh her first first public sailing to Keystone, she sounded three long hello blasts to the passing CHETZEMOKA. The CHETZY answered. I wished I had recorded that! First date in service will be June 24th. I imagine she'll be the #2 boat? At least for the foreseeable future. This is the TOKITAE as we see passing Edmonds this evening on her way back to her training base at Colman Dock, Seattle. What a great pic! You should sell this as a postcard. The TOKITAE is seen at Edmonds this morning as she heads up to the Columbia Beach run for what may be the final day of practice sessions before going into service. An Olympic Class ferry and the Olympic Mountains are seen in this photo. Cousins meet. TOKITAE and PUYALLUP. The TOKITAE is framed within the Edmonds Ferry Terminal. I advance to Mukilteo. It'll be out with the current and in with the new shortly. TOKITAE does a practice landing at Mukilteo. Practice until you're ready to serve. If you think the PUYALLUP is huge on the Kingston run, this will be huge on this run too! 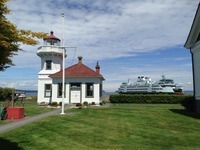 TOKITAE and the Mukilteo Lighthouse. On her way out. She did sound her whistle upon departure from a very short stay at the dock. Come tomorrow, or soon, she'll be doing this for real on this run. Is she on station and operating today? I had a great time at her open house two weeks ago, was nice to meet FerryNut in person. I have to admit that Vigor did a great job building her, detail fit and finish is excellent. May she have a long and great career! 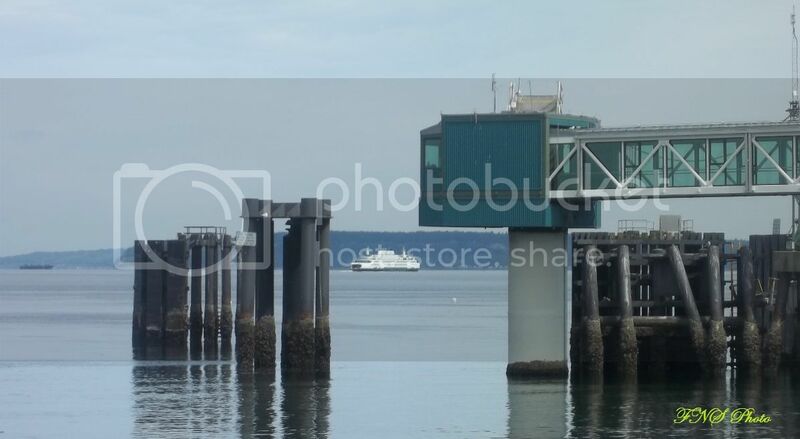 The state's newest ferry, the Tokitae, will not go into service on the Mukilteo-Clinton route today as planned. The captains have requested more training time and crew familiarization. WSF officials now anticipate putting it into service next week, but no firm date has been set. SEATTLE — The state’s newest ferry, which was delivered 75 days late, will not go into service on the Mukilteo-Clinton route today as planned. The captains have requested more training time and crew familiarization. 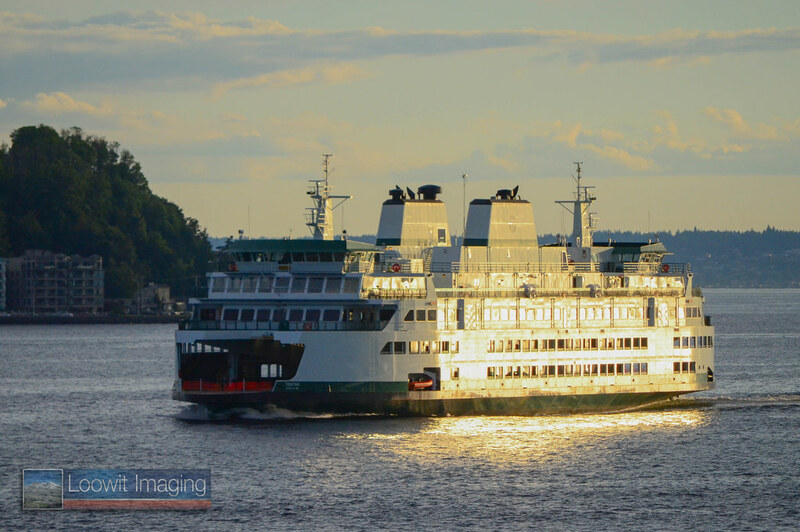 Interim ferries chief George Capacci authorized the delay “until they have a healthy understanding of everything on the vessel and the ability to operate it safely and efficiently,” said Washington State Ferries spokeswoman Marta Coursey. Officials now anticipate putting it into service early next week, but no firm date has been set, Coursey said. 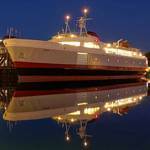 The 144-car ferry was expected to begin service with the opening of the summer schedule on June 15. That would’ve provided plenty of cushion between the original March 19 acceptance date in the contract. The state didn’t accept the boat until June 2, however. The ferries system and Vigor agreed that 54 of the 75 delay days were Vigor’s responsibility and WSF shared the blame on the other 21 because of change orders in the security system for obsolete equipment, a new requirement for a self-evacuation system and an out-of-tolerance shaft section it supplied. The contract rate for delay was $8,500 per day for a total of $459,000 to be paid by Vigor. Tokitae is the first of three Olympic-class ferries approved to be built. Construction on the Samish began in December 2012 and it is scheduled to be delivered early next year. A third boat was recently approved. It’s expected to be completed in early 2017. The construction budget for all three is $383.6 million. Vigor previously built three 64-car boats. Chetzemoka was delivered 48 days late, of which Vigor was responsible for 30. Damages at $6,000 per day totaled $180,000. Salish was seven days late with damages of $42,000. Kennewick was 30 days early. It's really becoming painfully clear that WSF is letting go of the Evergreen a bit too soon. Citing problems with the roll-out of the newest ferry boat, two key state lawmakers are calling for the heads of the top executives at Washington State Ferries. In a statement Friday, Rep. Larry Seaquist, D-Gig Harbor and Rep. Norma Smith, R-Clinton said lawmakers were misled about problems with the design of the newest ferry, the Tokitae. "One problem is that they apparently have mis-designed the ramps. 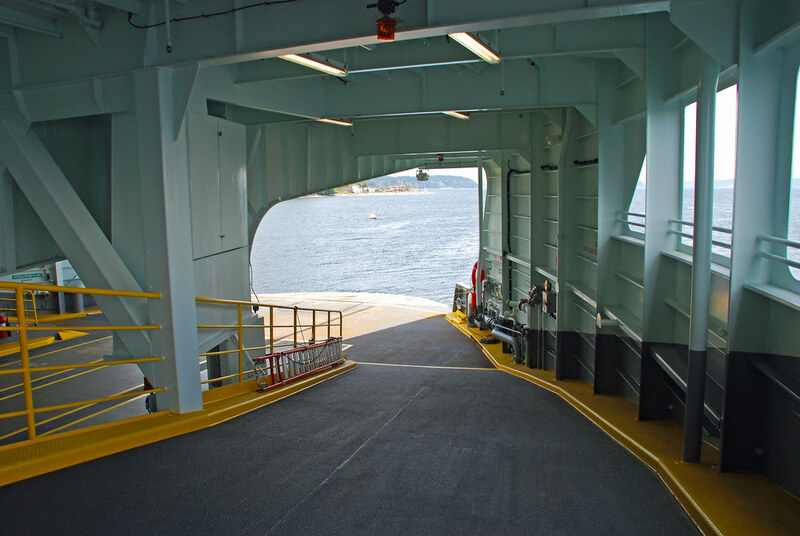 When you drive aboard the ferry, you either drive straight in or you drive up the ramp. Apparently, some cars will bottom out on that ramp," said Sequist. He claimed that during a visit to the shipyard in February, the legislators were told that there was no problem. Now, he claims acting Ferries director George Capacci told him the ramp problem can't be fixed. 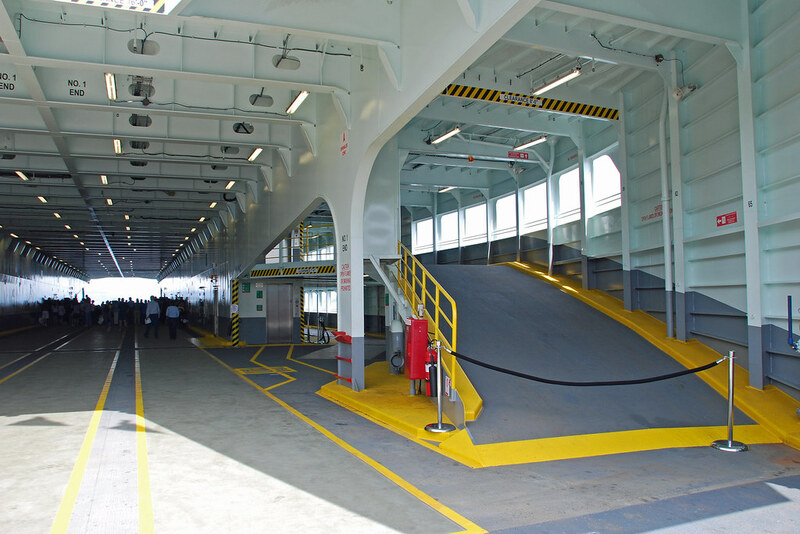 "They will have to use the deckhands to chose which cars go up that ramp," said Seaquist. He says he was told by Capacci that a change order will be entered for the next two boats in the series. The state has not replaced Ferries Director David Moseley, who retired in April. "I think the governor should step in and remove the entire leadership of the ferry system now," said Seaquist. Seaquist added he wants a detailed forensic audit of the contracts for the three, 64-car Kwa-di Tabil class boats. He's calling on Governor Inslee to bring in an expert review panel to develop a comprehensive plan for reform of the ferry system. A spokeswoman said Friday afternoon that the ferry system is preparing a response to the lawmaker's comments. Now that it is out in public, I can say that the problem with the ramps has been known for months. It's going to make it hell loading cars on the Tokitae because standard cars--say your Camry and Accord type cars and the like--are going to tear the bottom off the cars on those ramps. I assumed lawmakers knew about it...but it seems not. This was originally posted to the WSF news thread. But it seems to me that this article mentions a very important issue affecting Tokitae, so I've moved the article here. I think this is a big story, big issue, big problem. - does this just mean that the ramps are too steep? Is the only real solution to gut the ramps and rebuild them? That would be a big refit process. So much for the idea of quick vehicle loading on the south-Whidbey route. I wonder if there will be continual sailing delays of the Clinton-Mukilteo route, this summer, caused by the painfully slow loading process. It is interesting reading this again, today. I'd bet $100 they won't adjust the schedule, the simplicity of on the hour and half hour sailings is great. They'll get a few more cars as she's bigger and easier to load but they'll do what they do now, load as much as they can and then go. Objection! Point assumed but not proven. "Bigger" doesn't automatically mean easier to load. Supers are bigger than Issaquah-130s and they are right bears to load. WILL the Olympic class be easier to load than an Issaquah-130? Probably, especially if they've sloped the ramps correctly and don't have that stupid elevator bulge. But, like the wake question, it's going to take real-time efforts to find out. ...especially if they've sloped the ramps correctly. So I guess the final-answer is that bigger is not easier-to-load, in this case. When I was at Tokitae's Open House event, I walked the ramps and was struck by how steep they are. I remember thinking "this isn't much better than the ramps on the Issaquah's". 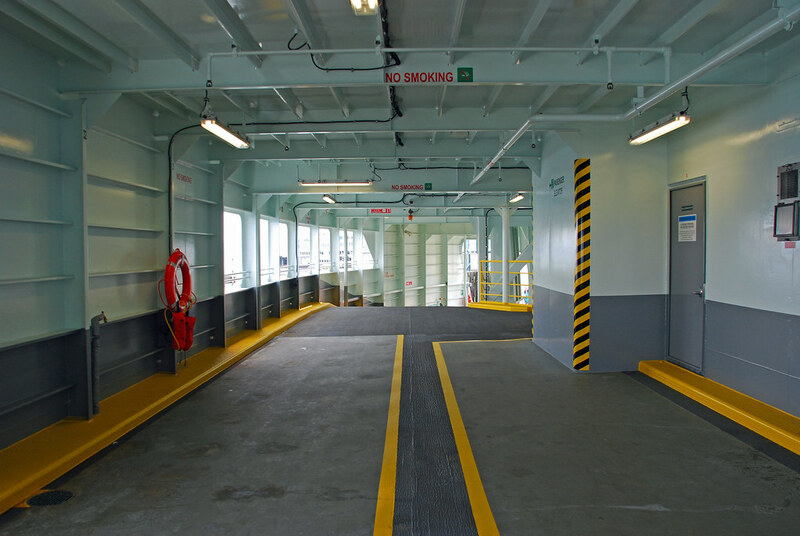 Marine architectural firms have been designing gallery wing ramps on our ferries for years. Except for the Issaquah class vessels, where the ramps were an afterthought, it seems like the design should be a "no brainer". It's a known entity - it's not like they haven't done this before. One thing that struck me is the sharpness at the top of the ramp. It seems like it does not gradually taper down as much as it could/should. Is that where the problem is, or is the issue at the bottom of the ramp? And, why was this not tested early on with actual vehicles of varying sizes and clearances, or was it tested, and ignored? I've included some pics of the ramps in question so others can see what it is being discussed here. It's a good thing I drive a small car. I think my KIA Soul should manage those ramps well. Put all the small cars (under 14) with high undersides with wheels near the ends on the Tween decks, bigger cars in the lower outer tunnels, and the tall ones down the middle. 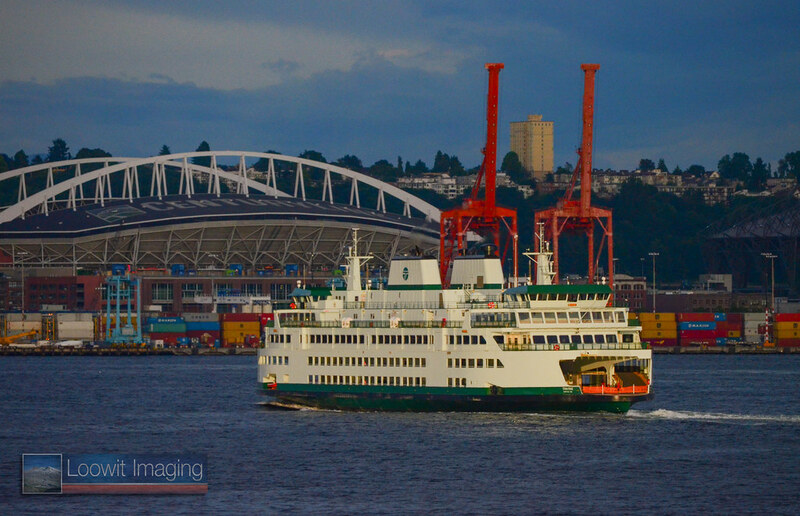 A couple photos of the Tokitae on a recent crossing over to Bainbridge on the M.V. Wenatchee. These photos are so good, they almost make her ramps work properly. All joking aside about the ramps, these photos are wonderful. Good to be captured in that perfect light. While this ramp issue isn't good, and should have been caught earlier, why is the solution another study? I want to know how many studies of WSF the Legislature has ordered in the past ten years and how much cost there has been to taxpayers. And didn't they already do a study of the 64 car boats and what went wrong? The study of the 64-car-boat construction was considered by many to be less than transparent. Did I miss something about a study of the Olympic class? I've already heard reports running about 50/50 as to whether the problem was addressed on the Samish. Those ramps aren't any steeper than the Issaquah' in the strictest sense, in fact they are shallower though not by much. So it looks like the issue is that sharp angle at the top? Does anyone know that for sure? The Issy's make that move in two changes in the angle rather than one here IIRC. Should've been caught for sure, shame. I'm sure it'll be "fixed" eventually, I don't buy that it "can't be fixed", more likely that someone was hoping they wouldn't have to do it and therefore admit that it was a problem. The legislature should figure that out for sure. In fact I'm surprised it wasn't fixed (or work on it started) during the 2 months of rudder mucking, but that's some serious structural work. From what I understand, it's the sharp bit at the top that catches the undercarriage. The problem has been known by management since at least February, if not before. I don't like the chances of even getting many cars started up the ramp let alone over the top.